Okay. It wasn’t me. And, I was nowhere near Phoenix. Not to mention, it would be more newsworthy if you DIDN’T pick up a tramp in Phoenix–but I digress. However, while I was at home–a little under the weather–this weekend, RL was at a couple of antique shows in the Phoenix area. And, while emails and phone calls came in, I soon learned that he picked up a tramp in Phoenix; a Syroco Tramp! Now for those of you in the know, this is truly the rarest of the Syroco corkscrews. While the Golden Knight fetches the highest dollar amount, it is the tramp that is the most elusive, with only a few collectors having it in their collections. A great find for RL, and it will be interesting to see if he decides to keep the tramp, or offer it to the highest bidder. I finally managed to win a M-73 (that’s JFO speak) slider corkscrew on eBay. Recently, it seems that RL has been snapping all of them up, and while this one isn’t a beer advertising corkscrew, it looks to be in nice shape. 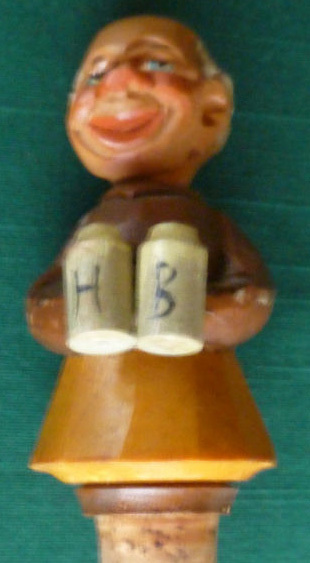 If any of you have this type of opener/corkscrew with advertising for beer/breweries I would be interested in trading for them! It is snowing again here on the island, and it seems we have a layer of snow, on top of a layer of snow, on top of a dusting of snow, on top of a layer of snow. And, there is snow in the forecast. While there are some corkscrew deals in the works, the focus remains on the construction of the new digs. And, today we managed to finish the majority of the sheetrock, and will begin mudding tomorrow or Friday. 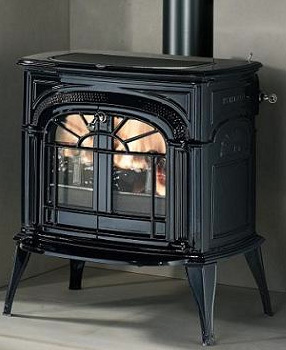 And, we ordered the woodstove which will be in the living room! It really is coming together, and hopefully next week, we will being installing the floors. As mentioned recently, Tommy has taken to posting an “It’s Wednesday and I Want…” on his blog. And, given that it is Wednesday, I figured I might as well follow suit. I know, I already have one, but “Snappy the Gator” has been lonely as of late, and needs a celluloid companion in the corkscrew swamp. I have corkscrews to trade, if anyone has an extra. Yesterday, our friend Jennifer and I headed off the island, and drove down to IKEA–in Stoughton, MA–to pick up everything she needs for her new kitchen. And, it is quite amazing at how an entire kitchen–minus appliances–can fit in the back of a borrowed van. Today we head back up to the island, but I know that we will be able to fit a couple of antiquing detours on the way back to the boat. BTW: the monk anri stopper did arrive the other day, and it is pretty much perfect. I am not sure whether this will stay in the collection or be traded away. If any of you are interested, feel free to drop me a line. I am heading off the island this morning for a quick trip to the Boston area. And, there will be some antiquing done along the way, and on the way back up. Hopefully, a corkscrew (or several) will be acquired during the trip. Photos and news to follow–should anything be news or photo worthy. Today we have been getting tons of snow. And, after heading over the new house to see if anything needed to be done this morning, I headed back home and hunkered down occasionally shoveling the drive/walk, making tea, and looking at proposals from hotels for the 2012 ICCA meeting. 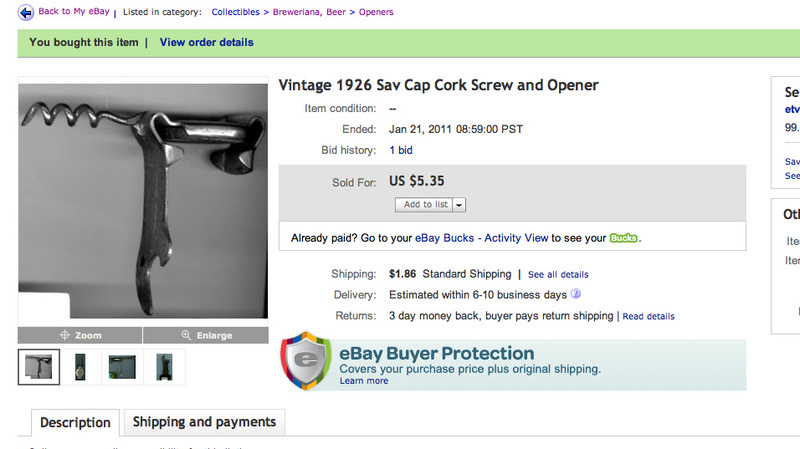 And, in between all of this, I happened to look at eBay for a moment, and what should appear but a buy it now listing for a 1926 Sav-Kap corkscrew/opener with a whopping asking price of just over 5 bucks. I have several of these, but I simply couldn’t resist. So, the Sav-Kap will be heading to Vinalhaven. That said, if you need a Sav-Kap, feel free to make an offer. Just prior to our trip to Chicago, there was a two corkscrew lot on eBay, that I placed a snipe bid upon with hopes 1) that I would win, and 2) that the corkscrew would be signed. The picture showed a henshall button corkscrew with a concave button, and I figured I might as well go for it. As it happened, auctionsniper did its job, and I ended up the winning bidder. And, so I waited this past week plus, and today a package arrived in the mail. Still, a nice early Henshall with concave button, fluted helix, and a junky direct pull to boot. For those more interested in construction updates: we continued sheet-rocking today, and hopefully tomorrow we will be finished with all the rooms except the guest bath, as the lumberyard didn’t have any water retardant sheetrock. However, taping and mudding will begin starting Monday, and the aforementioned sheetrock for the guest bath should be delivered late Monday to the house. More updates to follow!!! With pictures!!! 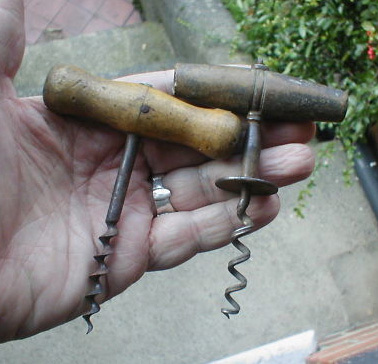 To be perfectly honest, I haven’t been spending much time looking for corkscrews lately, as most of my time has been spent renovating the new house. And, while there is indeed a deal in the works for a large collection, thus far it has only been a couple of email exchanges and nothing further. So, while I was researching wood stoves yesterday, I hopped on eBay for a couple of minutes, and saw a neat little Anri stopper that was worth bidding upon. I have never really been a collector of Anri stoppers, or any other stoppers for that matter, as they have little use in our house. Generally speaking, if a bottle of wine gets opened, the contents get consumed. However, the one that was ending last night was more than just a stopper. It also is a corkscrew!!! 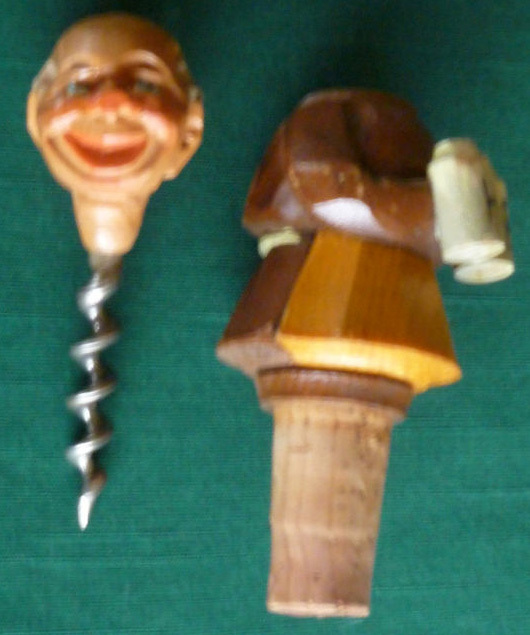 Yes, finally, I am actually writing about a corkscrew! Now, the photos from the listing are a little fuzzy, but this will make a nice addition to the corkscrew (not stopper) collection. No corkscrew news to report as of the moment, however, the sheetrocking has begun on the new house!!! The lovely and I arrived back on the island a few hours ago, and are settling in after a week away traipsing around Chicago. And, after heading to the gym in the morning, it will be back to construction chores.